I love peaches. As a kid, I remember staying up late “helping” can. 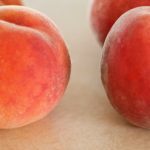 My crazy grandfather would buy 100 lbs of peaches and show up at our house with no notice, whether we liked it or not. Canning peaches would be the task at hand till late into the summer night. I was chatting with my mom on the phone, and my dad pointed out they had done up 120lbs of peaches this year, but it didn't seem so bad as it was a few at a time. I told her she was a crazy lady and then started totaling up what I had done: 75lbs. I am single. Everyone is getting canned peaches for all celebratory gifts this year. Although I do love canned peaches, 75 lbs seems a little excessive. 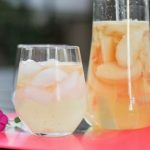 Paleo white peach sangria was a great way to use up a couple white peaches and a bottle of wine. 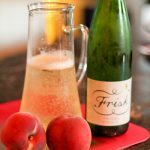 Before I knew it… I was fishing the wine-soaked peaches out of the bottom of the jug to eat while watching a movie. Yes, that happened. I did share. I didn't want to, but I did share. There is a local farmer who grows these white peaches: 20 years spray-free. Last year I discovered them late in the season and didn't save any. I was SOOOOO excited for this year. What the heck is the difference you may be asking yourself? As you can see from the picture: the color of the flesh. 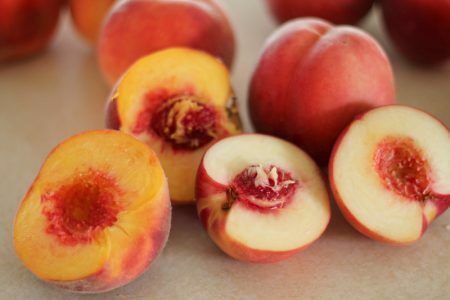 White peaches are lighter in color on the inside. The skin is a little thinner and slightly more red. They have a more delicate flavor. After doing some reading I discovered that that delicate flavor with undertones of honey and vanilla is due to a lower acidity. 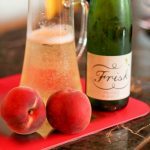 White peaches are generally free-stone as they ripen a little later in the season. Early peaches have stones that are firmly attached to the flesh; free-stone means the pit is more easily removed. Free-stone peaches are generally ready later in the season. There is also a semi-cling stone (the medium rare of peaches) and an heirloom donut variety (which I don't think I have ever seen). Unfortunately, earwigs often hide in freestone peaches: gross. Earwigs are my skin-crawling, wanna-scream-and-run-away bug. Not because I think they will crawl in my ear and eat my brain (urban myth), but because both ends seem dangerous and you have to really crunch them to kill them. Ugh… SO gross! It's a toss-up: early peaches you struggle off the pit or later ones run the risk of the dreaded earwig. Knock on wood, I haven't found one of those “booby-trapped” peaches yet this year. 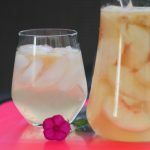 Enjoy white peach sangria while fresh peaches are in season; I know I will! But don't worry: you can substitute canned or frozen peaches too! 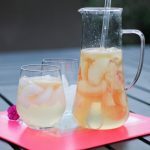 White peach sangria: the perfect patio refresher! 2 white peaches, peeled and sliced. 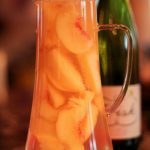 Peel and slice peaches, place in a jug or large jar. 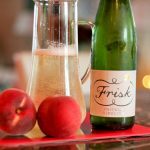 Pour entire bottle of wine into the jug. Add vanilla bean or 2 oz of vanilla liquor. Stir, gently pressing the peaches, let sit for 20 min. If you used a vanilla bean, remove or it will overpower the delicate peaches. 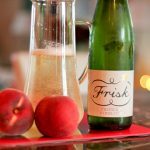 If you want a non-alcoholic version substitute the wine for soda water. Maybe you should make this with Paleo Ice. whoa, whoa whoa! This looks AWESOME!!!!!! 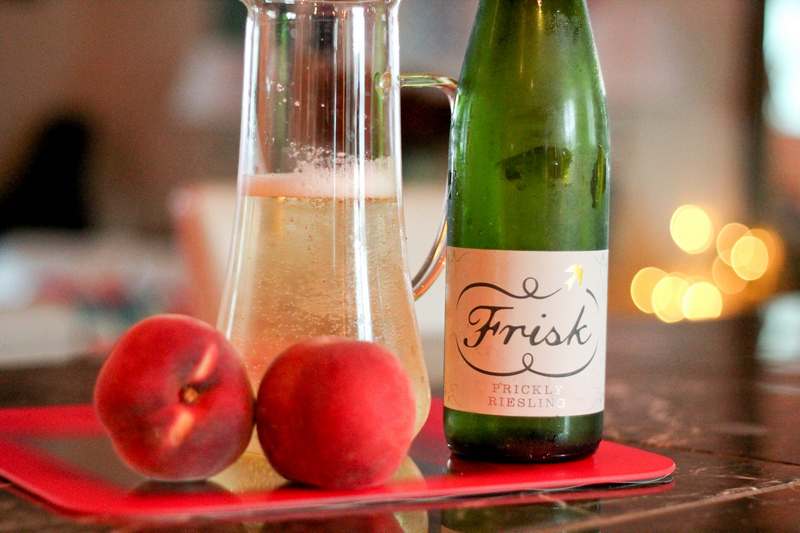 Might have to run out and buy a bottle of reisling tonight…. My Mom and I didn’t do peaches this year, but my Dad brought home an enormous flat of blueberries this weekend, so I think I’ll be heading over to their house to help with blueberry jam soon! 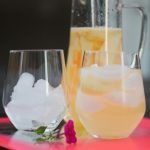 The sangria sounds amazing! I’d be digging those peaches out of the jug, too. Holley. I will make you a deal. You bring me white peach sangria. I will bring you anything in the world that would be a suitable equivalent to trade. Then we will feast, yes? PS. 20 years spray free is amazing. Good on the farmer and good on you for buying from ’em! Kristy let us share that sangria and you can tell me a story! I’ll tell you the story of the awesome hippie farmer who sells me the peaches! And a feast for sure! Will I see you in October?